Since 1926, Magtech has been dedicated to manufacturing high quality ammunition. The company also manufactures all ammo components, giving them full control of every stage of the production process and guaranteeing the quality of the final product. 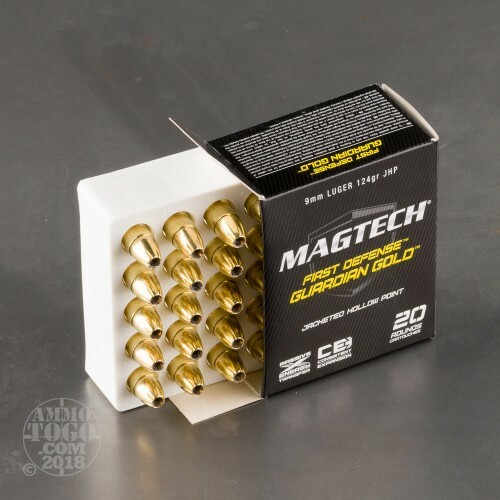 Only the highest quality raw materials and state-of-the-art manufacturing techniques using cutting edge technology are used to deliver the high standards that have made Magtech an internationally recognized name in the ammo industry. 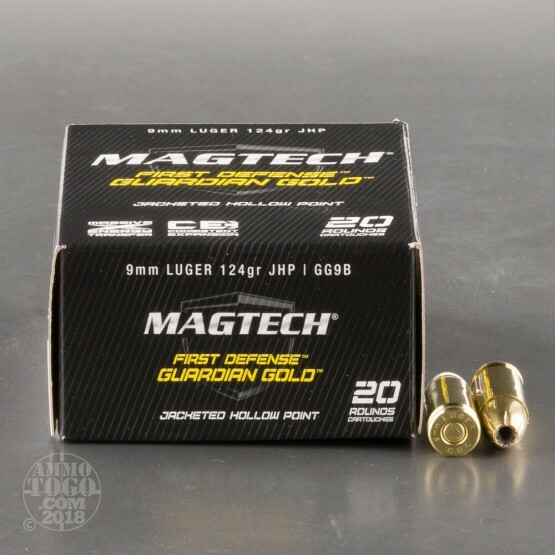 This package contains 20 rounds of Magtech Guardian Gold 9mm Luger (also known as 9x19mm Parabellum) ammunition. Each round is loaded with a 124 grain jacketed hollow point projectile. 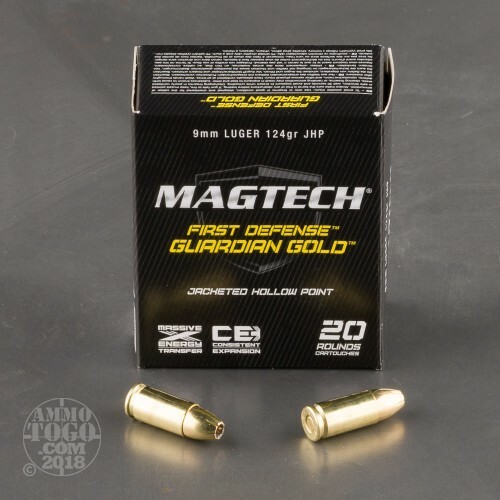 Providing powerful energy transfer, optimal penetration, impressive terminal expansion, and reliable pinpoint accuracy, Magtech Guardian Gold is a highly popular defense round for the budget conscious shooter. 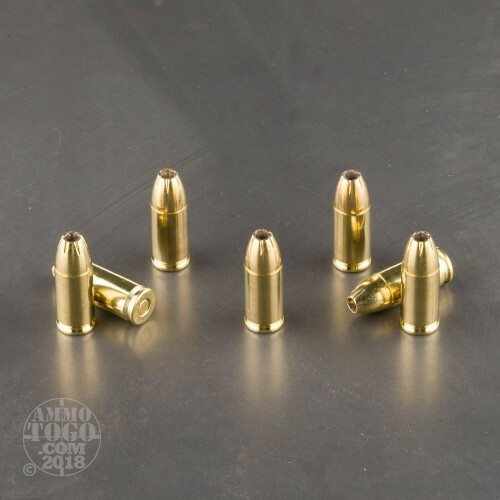 This ammunition is factory fresh, non-corrosive, boxer primed, and features high-quality, reloadable brass casings. Each round leaves the muzzle at a consistent 1096 feet per second with 331 foot pounds of threat-stopping energy. Law enforcement agencies around the globe depend on Magtech for their training and duty ammunition. All Magtech ammo meets SAAMI and CIP specifications. 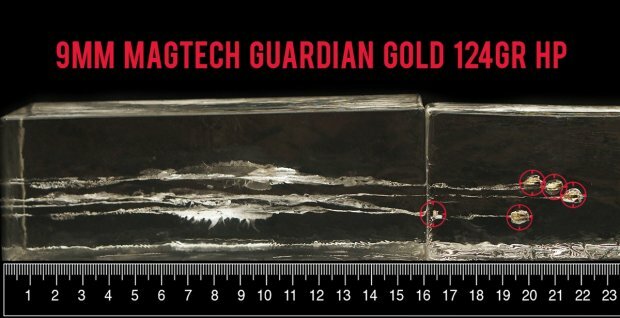 We fired five rounds of this Magtech 9mm Luger (9x19) ammo through a cloth barrier into Clear Ballistics calibrated synthetic gelatin and recorded the results. For these tests, we used a S&W M&P Shield with a 3.1-inch barrel. In the photos, graphics and video on this page, you can see specifically how the Magtech ammo performed and how it sticks up with the rest of the 9mm Luger (9x19) ammo we have tested so far. Penetration Depth Compared to 9mm Luger (9x19) Tested 0" 10" 20" 30" MIN 5.6" MEDIAN 17.7" THIS AMMO 19.7" MAX 47.5"